I today received a letter from a stranger whom I’ll call “Mr. X”. I get these letters – or similar phone calls – from time to time, usually at around tax filing season. I am an employment lawyer, not a tax lawyer. Prior to being called to the bar, I studied the allocation of taxation powers under Canada’s constitution, and concluded that the federal government does not have constitutional authority to impose an income tax if the revenues from the tax are at least in part for provincial purposes (i.e., for things falling under exclusively provincial legislative jurisdiction, like health care and education). I also concluded that there is no chance that any court would declare the federal government to lack the constitutional authority to impose the federal income tax. I’ve also explained to people, numerous times, that I do not provide legal advice in respect of taxation. Those interested in knowing more I refer to a tax lawyer, such as David Sherman of Thornhill (at least, that’s where he was at one time). For reasons I’ll not get into here, I have little reason to doubt that some of the calls or letters I receive are essentially from undercover tax cops hoping that I’ll advise them not to file or not to pay their taxes…advice I never give. I share that with you only so that you will understand the tone of my response to Mr. X, further below. However, at this point, there is still a lot of time, but one thing I know, that income tax in this country is nothing but a very sophisticated scam. I also noticed that you somewhat agree with that. My question for you is: How do you get around paying income tax, legally? I’m just so sick of this game that consists of ruining people’s lives – forcing us to make every decision based upon income tax. We live in constant fear of non-compliance that I’m so close to actually leaving the country, thus not being a resident of canada. I would recommend against failing to file. I do not “get around paying tax”. I file, I disclose fully, and I pay dearly. Believing that the government is not complying with the law is very different from believing that one has a chance of doing anything about it in our courts. The folks posing as our government have the guns, they have the jails, and far far too many people (many of whom vote for the politicians who give us these tax laws) are quite happy to have them take money from those who earn it, and spend it on those who do not (i.e., to have the government seize your earnings, and spend it on those who probably would never survive if left to their own devices). The only solution is the election of enough Members of Parliament who actually care about individual freedom, and who actually respect the constitution. Until then, fines, jail, and other injustices await those who fail to do what our elected officials force us to do at the point of a gun: confess the sin of having created wealth upon which every individual’s survival and happiness depends, and pay the required fine (i.e., taxes) for having committed that sin. Judges are federally appointed, and none of them can reasonably be expected to conclude that the federal government has no authority to impose an income tax the revenues from which are ultimately spent on provincial purposes. Write, speak out, get politically active, and – so long as they’re taking money from you at gun point – comply. If you want to swap yearly punishment for a yearly bonus, the answer’s easy: choose evil. 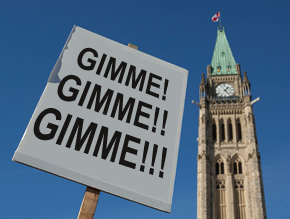 Stop working, assume the role of a child, stand with others holding signs that – in effect – say “gimme gimme gimme”, and start voting for a living, like they do.